I love discussing food with Baba. The Man knows his food and especially Bengali food. It was the day of Dashami, my father was at my place. We both were discussing the history of Sondesh while planning for the mandatory sweet purchase and sweet making at home for Doshomi. One sweet that we both were remembering was Monohara and probably we were remembering Bultu Jethu as well! Our discussion then followed by making Monohara at home and finally this blogpost 🙂 . I have been making sweet for Doshomi since last few years and this has started when we used to stay in Gurgaon. Probably the unavailability of typical Bengali delicacies was the reason I started making Misti at home. 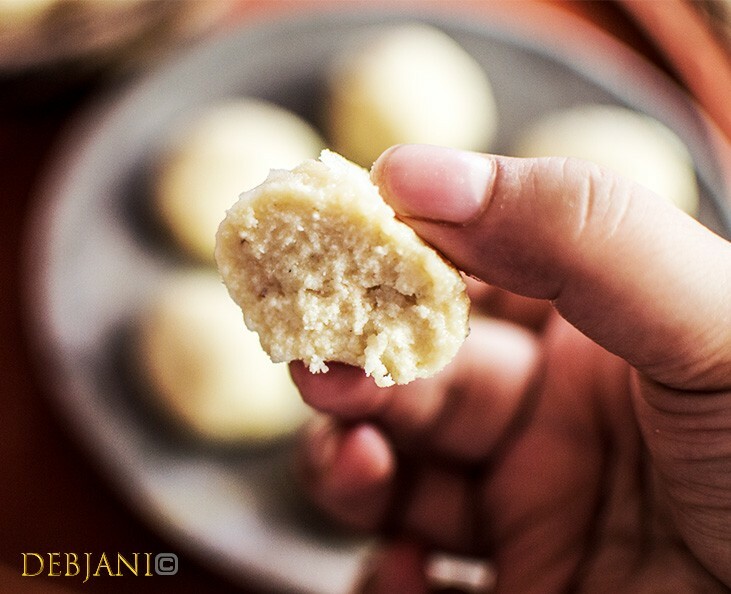 We though have shifted our base to Kolkata in 2015 but I never stopped making sweet at home. This year. as I mentioned I made Janai-er Monohara. A rare gem of a sweet I had tasted years back thanks to a distant relative of mine. “Monohara” it is a famous sweet from Janai, a small township in Hoogly district. When I told Baba that I was planning to make Monohara he asked: “are you remembering Bultu Jethu dear?”. I smiled and replied, “who else but Bultu Jethu! After all, he introduced me to this sweet Baba, don’t you remember!” Dad laughed and replied, “not only to you but all of us from our north Calcutta residence were introduced to this Misti by Bultu da”. Then Dad asked “do you remember how you used to hate him! He was an amazing teacher Dolon but you never liked him and that is why your English is horrible!” “okay, you don’t need to remind me that episode dad! He was like a monster but I can’t say that about Monohara for sure! 😛 😀 ” I replied! We still have a joint family at our North Calcutta residence. Back in the 50s and 60s (when I was not even born), in fact, dad was in his teens, several distant relatives used to stay at our place. They were not typically from Kolkata but used to work in the city. This system, in fact, was quite popular in the old residences in Kolkata to support the distant relatives. At times I miss that charm! Bultu Jethu was my father’s 3rd cousin and was working for a Kolkata based firm. He was originally from Janai, and he introduced Janai’s famous Monohara to our family. In fact, I had it almost every year till mid-2000. Bultu Jethu used to bring a big box full of Monohara after Doshomi every year. 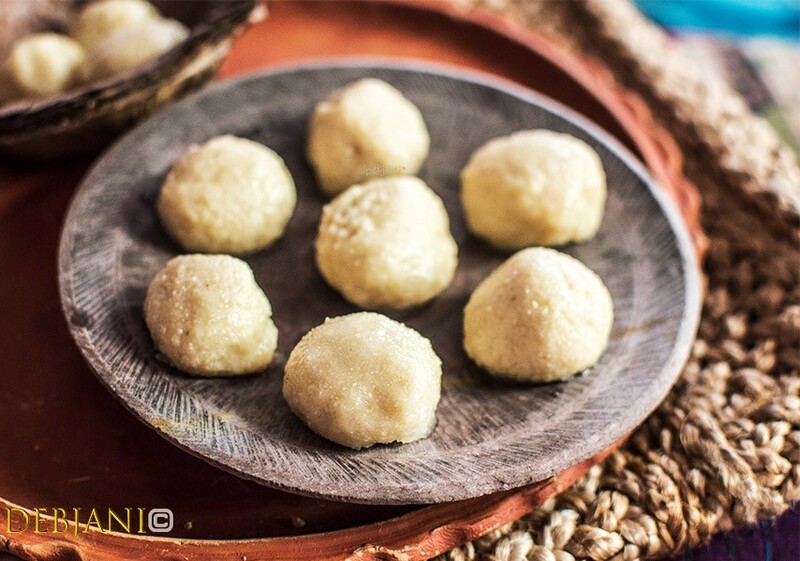 Simple taste, light smell of Cardamom, a crunchy Sugary outer-crust and loaded with Chana, Monohara is divine yet different from typical Sondesh! After that, I shifted my base for higher study followed by Job and Marriage and Bultu Jethu also died in late 2012 as well. Bultu Jethu was a bachelor and naturally, after him, our link with Janai broken and so was with Monohara. I actually forgot the sweet completely until a few months back. I found a Bengali Book on “Sondesh” named, “Sondeshnama” with my friend Rukshana and she was kind enough to give it to me! 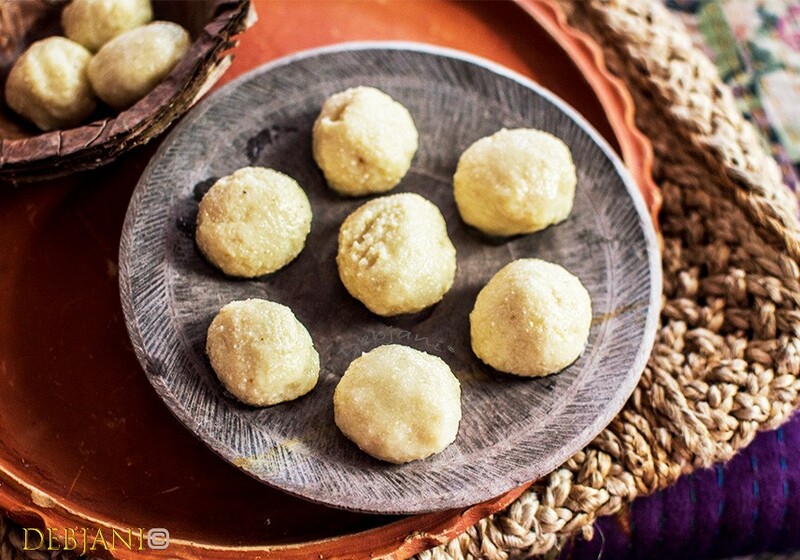 It was Sondeshnama that reminded me the thick Sugar-coated Sondesh, Monohara from Janai. The book for that matter is a rare gem and it was indeed a nice read. I was, in fact planning to make Monohara for the month but I was not sure with the recipe! No book or internet search had helped me a much. I found a recipe with coconut but as far as I remember the Monohara Bultu Jethu used to bring was prepared with Chana! I finally decided to as my “Sobjanta” father to help me out. He told me Monohara is characterized by the outer Sugar quoting but not the stuffing inside. One can mix Coconut with Chana but that is not mandatory. In fact, Baba told me about the link of Monohara with the family of Raja Kaliparashad Mukhopadhyay from Janai as well. I found the same story has been referred by Wikipedia too. Monohora came into existence during the late British period. 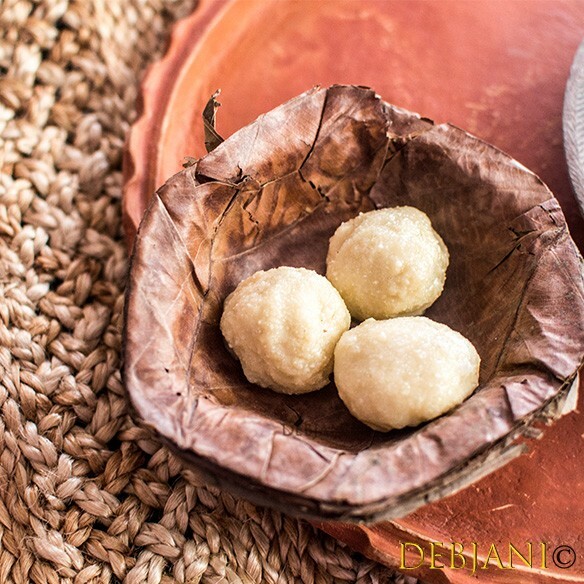 Almost similar to a typical Sondesh prepared with Chana, this sweet is coated with thick Sugar paste/ Syrup. 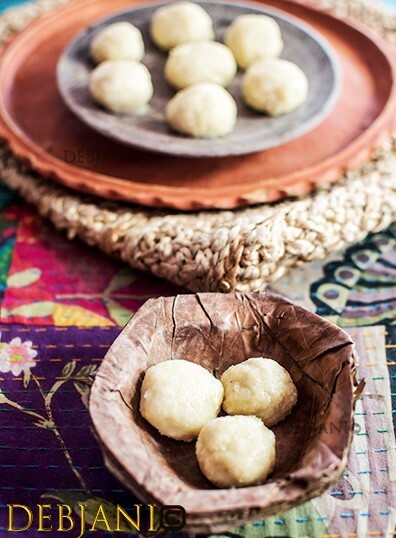 It was said that a “Moira” coated a few Sondesh with sugar Syrup to give the Sondesh more self-life. The details are verified by my friend Sharmishtha Cheema who is the descendant of the Janai Rajbari and she also informed that the Moira who made Manohara first shifted to Kolkata and his descendants started a sweet shop which is none other than legendary Bhim Chandra Nag! If we Translate, “Monohara” means something that is beautiful or alluring. Keeping the natural beauty in mind as well as the Monohara I tasted years back, I decided to keep the recipe simple. Janai-er Monohara (মনোহরা), Hoogly districts famous Sondesh! Sweet memory revisited! Monohara is a Bengali Sondesh originally from a small town Janai, Hoogly. Simple taste, light smell of Cardamom, a crunchy Sugar coated outer crust and loaded with Chana, Monohara is divine. Green Cardamom Powder: ¼ Tsp. Take Chana* over a Cheesecloth and tie the ends of the cloth. Put some weight over the Chana to remove the water content for 20 minutes. In the meantime, start boiling the Milk to reduce to thicken it. Cook in low flame for 20 minutes and stir in between. You will get around 4 Tbsp. of thickened Malai after the cooking is done. Now take Chana, grated Mawa and Malai in a bowl and add Cardamom Powder and mix using your hand to make a lump-free paste. Heat a pan on medium flame and pour the paste along with the Sugar and start cooking. Stir continuously for 5-6 minutes and cook in low flame until the Sondesh leaves the edges of the pan. Switch the flame off and take out the Sondesh in a bowl. Once the mixture cooled down completely make 2" size balls* using your hands. Now take the Sugar kept for thick Syrup in a pan and add 5 Tbsp. of water just to cover the sugar. Keep melting the sugar in high flame. Stir continuously using a spatula; this will help crystal formation. Keep boiling till the syrup thickens; a consistency of 3 strings is ideal. Take the Syrup out in a bowl and leave it for 5 minutes to cool down a bit. Cover the Sondesh with Sugar syrup; use a spoon for this step. 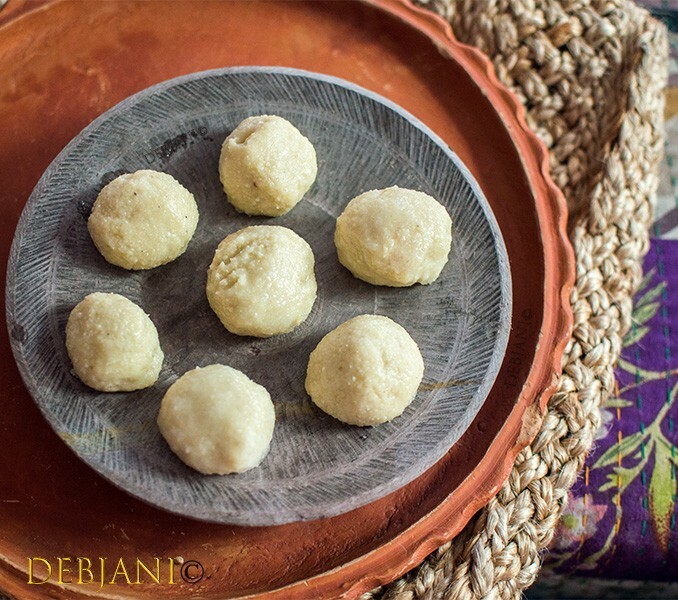 Place Manohara on a plate and wait till the sugar thickens and form a crunchy layer over the Sondesh. Serve Monohara once the Sondesh set completely.Monohara can be stored in the refrigerator for 2-3 days in an air-tight container. I am available with good quality Chana in Kolkata and hence used that. In case you are not available with the same, check this for the recipe of Chana. The Monohara I had, used to be without any special decoration and were simple ball like and I keep that size and have not opted for any decoration. 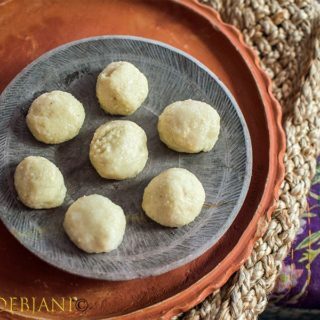 If you like this recipe, you can also try the Gurer Rosogolla, Gurer Sondesh or Kancha golla from my blog. 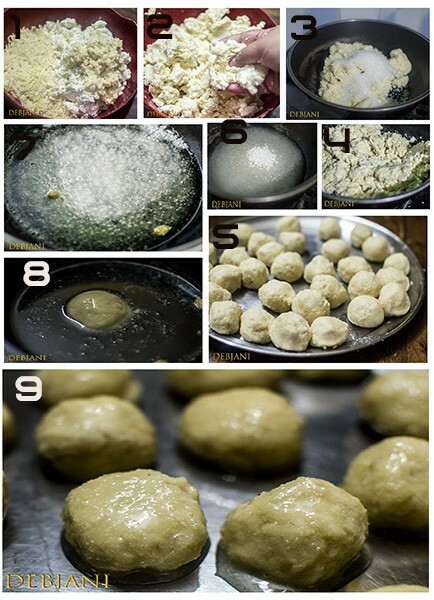 Have you tried the Monohara Recipe from Debjanir Rannaghar! Do let me know how it came out. Also, I would love to see a picture of the same which you can share here on dolonchttrj@gmail.com. In Instagram, you can use my hashtag #debjanirrannaghar or can tag me at @foodofdebjani.